For the first time though, I was looking forward more to 2gether, the Korean album, than Colors, the Japanese one, even if I have traditionally preferred their releases in Japan more. Someone said that old-time fans may like Colors more than 2gether. Colors is more old school rock while the band tries out new sounds in 2gether, a move that may isolate some of their fans who long for the familiar. But it was Rollercoaster that easily became my top favourite in the album from the time I listened to the sampler. It is a testament that Yonghwa is not just a prolific songwriter but also a great storyteller through his music. The reggae-like beat conjures images of a day at the theme park and going up and down the rollercoaster. To be able to bring those images to mind through music, not necessarily through the lyrics (especially for someone who is not a Korean native speaker), makes Yonghwa a talented musician in my book. Hold My Hands is another early favourite from the album. I love the jazz and brass feel to the song. They mentioned before that this is perfect for a jazz bar and it does transport you to that, something you won’t really picture CNBLUE whose rock and pop sound has brought them to stadiums and arenas across the world. But if for anything, it only proves that they are becoming more versatile as they get older. And maybe their years in the industry has given them enough confidence to test their limits (and the fans’ taste). There are three songs included in 2gether that are the Korean versions of their previous Japanese releases: Control, Radio and Footsteps (a version of Heart Song). All are good reworkings and I especially love how Yonghwa’s raspy vocals provide texture especially for Control and Radio, with the latter always sounding even better live. Jonghyun has two compositions in 2gether and his work highlights the difference in style with Yonghwa. Hero, a song inspired by his father, is an upbeat number contrary to the cliched ballads when doing tributes for loved ones. I love the chorus because it evokes childlike devotion to someone’s hero figure, which is what the song is all about. Drunken Night, also a Jonghyun composition, is another favourite in the album. I love the beat, it’s perfect for Friday nights (I can almost visualize this being used as a background of a beer or soju commercial) and the harmonisation of Yonghwa’s and Jonghyun’s voices in the bridge sound so perfect. It’s good that Yonghwa and Jonghyun have different composition styles because it adds even more musical layers to the band. In fact, there are more colors in 2gether than, well, in Colors. That is not to say though that Colors is not comparable with 2gether. It largely depends on your musical taste. Let’s just say that if you go to your favorite bar, Colors may be your vodka on the rocks if you’re in the mood for something familiar while 2gether will be your absinthe if you’re feeling adventurous. Colors has two previously released tracks: White and Irony, both composed by Jonghyun. His third composition in the album, Lucid Dream, is very J-pop, and needless to say, I love it. Bassist Jungshin also composed a song, Daisy, for the first time, under the guidance of Yonghwa and it comes out pretty decent, though a tad generic. The album’s lead track is Supernova, which Yonghwa composed. 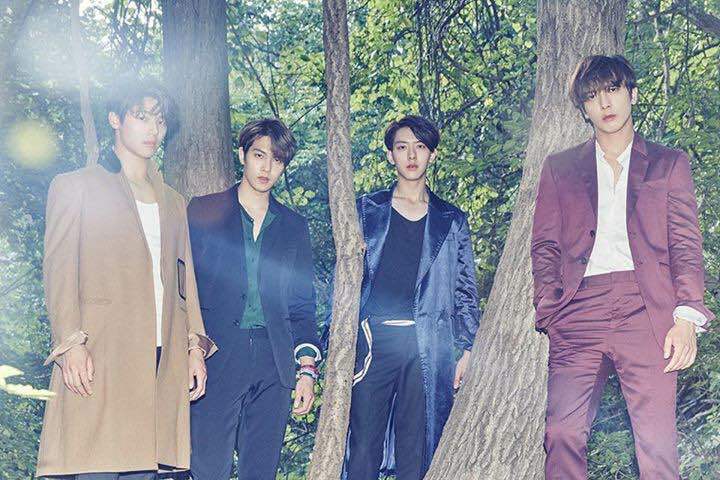 It’s a soothing tune for those who constantly look for CNBLUE’s trademark sound. There’s also the Japanese version of Hold My Hands. Hold Me and My World sound like companion tracks. Yonghwa’s soulful vocals are perfect for the songs, you can actually feel his pain and torment in the two love songs expressing someone’s longing to love freely and protect the person he loves. And as he croons about begging a girl to love him and stay by his side, you just wanna ask, Yonghwa-ya, tell me who hurt you and I will throw Cinderella’s shoe at that person. Meanwhile, the intro notes of Holiday reminds me of Arashi’s Re(mark)able but I gotta say, I very much enjoy the Yonglish in Yonghwa’s Japanese compositions, including in Holiday. My favorite track in the album is Realize (more Yonglish though the more I listen to this song, the more I am convinced the lyrics printed with the album are a mistranscription). The lyrics are so deep and I kind of understand why Yonghwa described the song as “unique” as it does have a different character compared to the rest of the songs. Sometimes though, it is hard to understand the Yonglish (and the Jonglish for that matter). Speaking of Yonglish, the lyrics to Domino used to bother me because it sounded like “like A DOMINOS” and it didn’t help that Yonghwa said this was inspired by his favourite food, pizza. But on closer listen, it is actually “like ’em dominoes”. Whew. There is more Yonglish to enjoy in the garage band-sounding Catch Me, Yonghwa’s anthem to his and the band’s haters. As for CNBLUE fans, how lucky it is to have two albums within the same period. I just wonder though how sound it is business-wise to release two albums 15 days apart. Yes, they are different and supposedly geared for different markets too, but in this globalized world, if you are a fan of an artist, does it really matter? Globalization has taken down not only trade barriers but language barriers as well, so whether they’re singing in Korean or Japanese, what really matters is that the music resonates, doesn’t it? Well yeah, an inner voice is telling me, the different markets do matter. Japan is No. 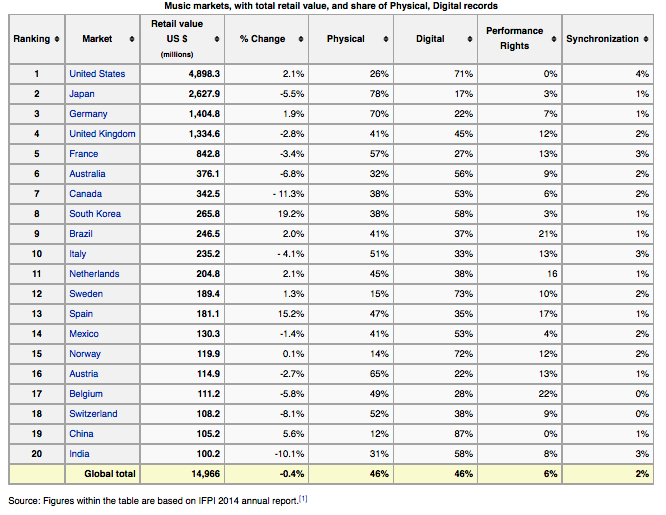 2 biggest music market in the world and in terms of physical sales, it is No. 1 with 78% share, but South Korea (No. 8 worldwide) has a bigger share of the digital sales (58%). I wonder if there will come a time that artists would have to do “China albums” too, considering that China takes up 87% of digital sales already. But the bigger the markets, the better it is for artists, and for Jung Yonghwa and CNBLUE to bring their music to the top of the world. Now if I have to choose between the two albums, I’d pick 2gether for the day and Colors for the night. 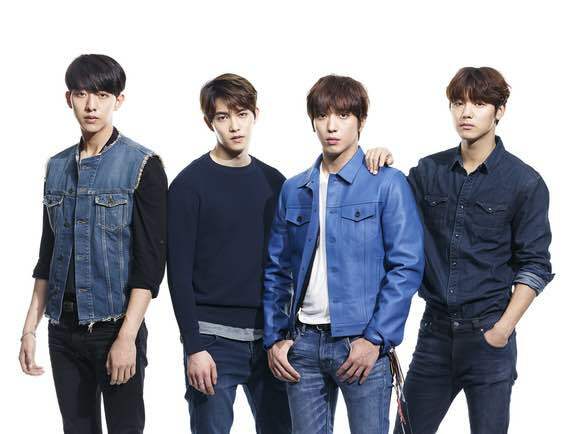 It’s amazing how CNBLUE, and JYH for that matter, can produce two albums in a year. I hope they include new songs in their new tours (no repeat please of Wave and Can’t Stop tours that did not have that much difference in set list; don’t get me started with the forgettable White tour). CNBLUE has a rich discography that there are just some songs they don’t sing enough. And because they always sound awesome in their lives, I’m looking forward to hearing them sing Cinderella, Rollercoaster, Supernova, Hold My Hands and Realize live. Please don’t disappoint, juseyo. ← [fandit] celebrities owe fans…what? Dear friend, as I know CNBLUE has included many of their new songs, including Holiday, Realize, etc. in their concert in Shanghai last Saturday. Also, I personally like 2gether better than Colors, yet it does not mean that Colors is not a great album. Again, Yonghwa has proved himself to be a prolific and a leader (I think) in the K-pop industry. Thank you for another awesome analysis of CNBLE and Yonghwa’s music!!! I am a constant follower of your writings, especially ones about Yonghwa.